Just Aim For The Coconut Tree! How many of us love to leave our local club for change of location in a different setting for a few days golf with a few mates? If you live in a cold climate, then going to a warm climate makes for a great for a golf holiday. Or if you live in the middle of a city playing, then alongside the ocean is certainly an experience not to be missed. As Thongchai Jaidee, Asia’s No 1 golfer says, ‘What Thailand can offer is great courses, wonderful locations and endless smiles!! !’ Well Thailand with it superb locations, fantastic courses to challenge all levels, good prices and those smiling caddies certainly tick all the boxes for a great golf destination. Amazing Thailand is the Tourism Authorities slogan, and to be honest for a golfer, that really is the case at the moment. Many of us seasoned travellers to Thailand for golf, may have experienced the famous courses such as the Thai Country Club in Bangkok, or the Blue Canyon in Pucket. But we all enjoy a new challenge and certainly the Banyan Golf Club in Hau Hin, is a great addition to the list, and worthy of a visit. 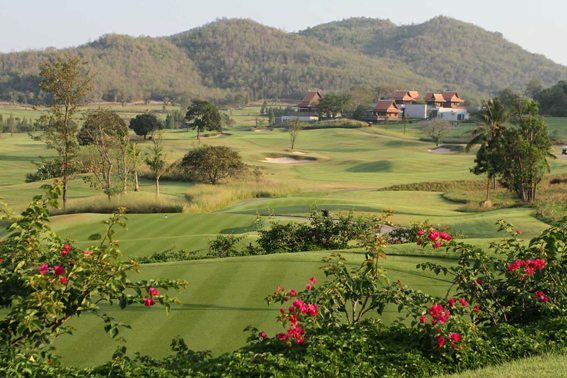 Banyan Club, which had a soft opening in October 2008 has already become the favavorite course of the Thai Prime Minister, and many local and overseas players. Built across a valley and surrounded by mountains, the Par 72, 18 hole golf course is a test for players of all standards. Designed by Thailand’s leading golf course designer Pirapon Namatra, the course ranges from 5,087 yards from the ladies tees to a tougher 7,361 yard from the Black tournament tees. Recently I played a round in the morning, and the course looked excellent with a light mist hanging over the mountains, giving a gently breeze! Hole 1 is a great starting hole as the elevated tee boxes provide you with a superb panoramic view of the front nine. Just aim at the coconut tree and you are off! The course is fair with several tee boxes for all levels. There are lakes, pot bunkers, streams, even pineapples growing alongside the fairways, adding to this unique experience. Most of the holes enjoy that ‘WOW’ factor. One of my favourites is Hole 10, the second hardest hole. A 430 yard Par 4 with a very deceptive valley in the middle with the green high up at the top. As you tee off down in to a valley the second shot upwards has to be very accurate to make the green. The club’s signature hole 15 a 147 yard par 3 which has again elevated tee boxes overlooking the ocean views of Singtoh Island to your left and mountains and valleys to your right. The peaceful surroundings and the welcoming clubhouse make for a perfect round of golf. Banyan Golf Club is a great addition to Thailand’s 300 courses.